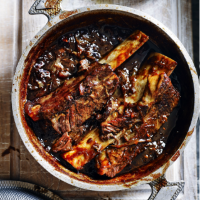 Short ribs are hugely popular for good reason: not only are they economical, but cooking the meat on the bone adds heaps of flavour to this soy and anise-scented sauce. 1. Heat the oil in a large casserole dish. Season the short ribs and brown over a medium-high heat for 3-4 minutes on all sides (you may need to do this in batches, adding a little more oil); set aside. 2. Add the shallots to the pan and fry for 5 minutes, until golden and starting to soften, then add the garlic and ginger; cook for another 2 minutes. Add the star anise, soy sauce and stock. Return the meat to the pan with any resting juices, bring to the boil and reduce to a simmer. 3. Cover and simmer for 3 hours, until the meat is very tender. (At this stage you can either leave the meat on the bone or shred it with two forks.) Simmer, uncovered, for another 40-45 minutes, turning the ribs occasionally, until you have a rich sauce that coats the meat. If not, reduce it a little further. 4. Season, and add lime juice to taste. Rest for 15 minutes before serving with wasabi-spiked mashed potato or sticky rice, if liked. Follow steps 1 and 2. Secure the lid and bring to high pressure. Reduce the heat to low and cook for 50-60 minutes, until the meat is tender. Uncover and simmer briskly for 20-25 minutes, stirring often, until the sauce is thick. Follow step 4 to serve. Put everything – except the oil (it isn’t needed) and lime juice – in the cooker. Cover and set to low for 6-8 hours, until the meat is tender. Set the ribs aside. Reduce the braising liquid in a saucepan, over a high heat, until thick. Mix everything back together; follow step 4 to serve.